Global Pressure Sensitive Tapes & Labels Market – Industry Analysis and Forecast (2018-2026) – by Backing Material, Adhesion Type, Product, End-user and Region. Home » Reports » Consumer Goods & Services » Global Pressure Sensitive Tapes & Labels Market – Industry Analysis and Forecast (2018-2026) – by Backing Material, Adhesion Type, Product, End-user and Region. 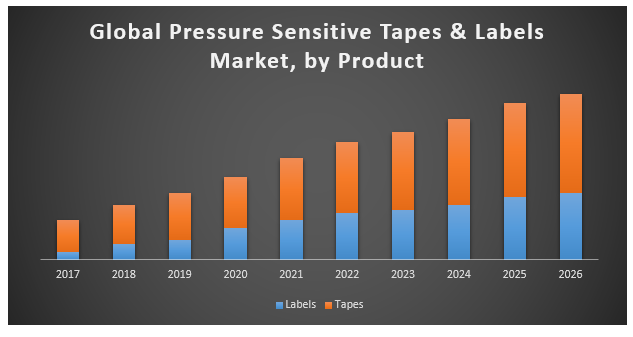 Global Pressure Sensitive Tapes & Labels Market was value US$ 94Bn in 2017 and is expected to reach US$ 160Bn by 2026 at a CAGR of 6.8%. The objective of the report is to present a comprehensive assessment of the market and contains thoughtful insights, facts, historical data, industry-validated market data and projections with a suitable set of assumptions and methodology. The report also helps in understanding global pressure sensitive tapes & labels market dynamics, structure by identifying and analyzing the market segments and project the global market size. Further, the report also focuses on the competitive analysis of key players by product, price, financial position, product portfolio, growth strategies, and regional presence. The report also provides PEST analysis, PORTER’s analysis, and SWOT analysis to address questions of shareholders to prioritizing the efforts and investment in the near future to the emerging segment in the global pressure sensitive tapes & labels market. Increasing levels of international trade coupled with a rising need for packaging materials will fuel product demand in the upcoming years. Pressure sensitive tapes & labels are continuous flexible strips of plastic, metal, paper, cloth or other materials coated with an adhesive which will stick to a multiplicity of surfaces at room temperature and with a light application of pressure without the need for any phase change. The chief uses of these products include bonding, packaging, masking, sealing, and labelling. Increasing demand for these products in a wide range of high growth industries for instance electronics, construction, automotive, packaging, etc. will augment the pressure sensitive tapes & labels market throughout the forecast years. Polypropylene segment based on backing material held the largest market share in 2017 and will hold sway during the forecast years. Its growth will be increased by polypropylene’s superior moisture and chemical resistant properties. Good fatigue and impact resistance along with its resistance to electricity also significantly raise its demand as a backing material. Tapes segment is dominating the global pressure sensitive tapes & labels market. The segment will exhibit growth by more than 7% CAGR and this growth will be majorly driven by the product’s usage in several end-user industries such as construction, electronics, automotive, etc. Labels can be of a variety of materials and contain written or printed information about the product or item that it is attached to. Growth in the healthcare segment will be promoted by the number of orthopaedic injuries and steady gains in surgical procedures. Furthermore, ageing demographics and increasing life expectancy will spur increased overall healthcare spending. Advances will be moderated somewhat by improved competition from alternative wound closure methods and a trend toward minimally invasive procedures. Region-wise, the Asia Pacific packaging industry has been experiencing high growth in the last two decades with China, India, and Indonesia is the most important contributors towards this growth. The Chinese packaging industry will grow by more than 6% by 2026 and is likely to replace the U.S. as the largest packaging market by the end of 2026. India is one of the fastest growing packaging markets in the world with revenue exceeding 45Bn in 2017. Additionally, developments in the flexible packaging industry coupled with increasing demand for corrugated box packaging will drive the pressure sensitive tapes & labels consumption for wrapping and labelling applications. • Fuji Seal International, Inc.
17.3.14. Fuji Seal International, Inc.